Im going to bump this thread in hopes of getting more information. I have a 17T and was looking for pictures/video of setups using the H-rail. We are looking at purchasing 2 down riggers and we do not want to drill holes etc. Thanks in advance, fingers crossed someone posts some help. Hammer - Here are some driveway photos of my Scotty DepthMaster on my new 2016 PA14. I fabricated a mounting plate out of 2 H-Rail Universal Bases and some cheap breadboard material, cut and shaped to fit. 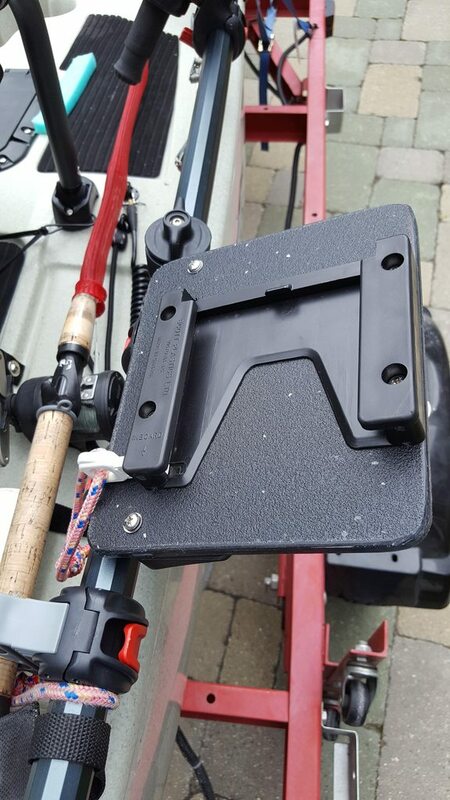 I rotated the Scotty Base to keep the downrigger arm close to the hull. I can mount it with the arm pointing forward or backward, and mount on right or left rail. Digital depth read-out will read upside down in 2 of the 4 possible positions, but can be easily reset to read properly if you prefer just one location. I mount it on an angle on the H-Rail to keep the ball closer to the hull and minimize my "footprint". Rod forward. Overall, this arrangement works well. 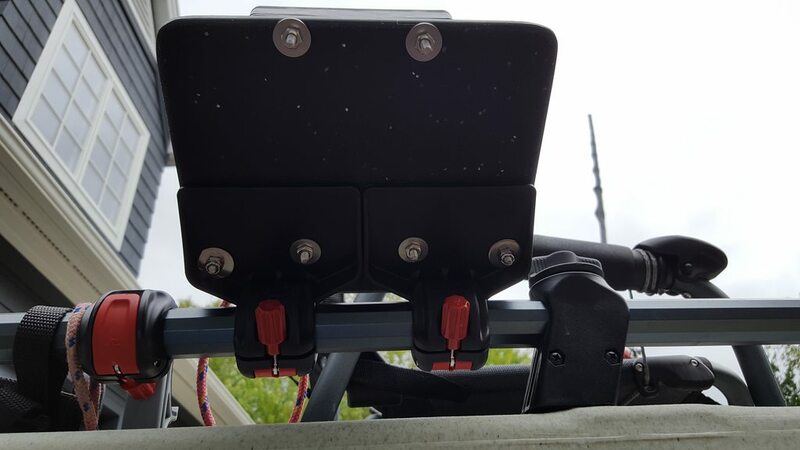 My only complaint is that whereas I had the Scotty base plate permanently mounted to the hull on my old 2010 PA14 (and thus, always available but out of the way) this removable mounting arrangement requires a good bit of storage space if you bring it out on the water without mounting it. 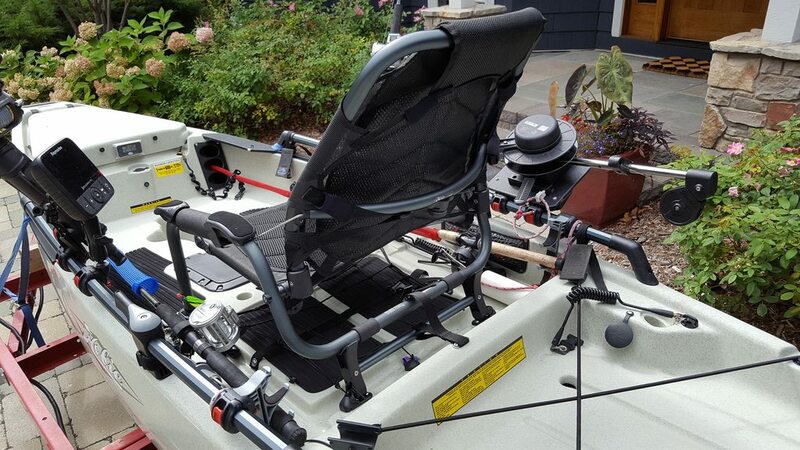 Doc SteelheadCatcher advocates just mounting it each trip, but depending on what I am fishing for, it can be overkill and tends to get in the way of paddling if not needed. I still haven't figured out a good way to store it onboard when not mounted for use. Awesome!! Thanks for the quick reply. What is the model # on that downrigger? That's the Scotty Depthmaster 1050. Cut the arm way down. 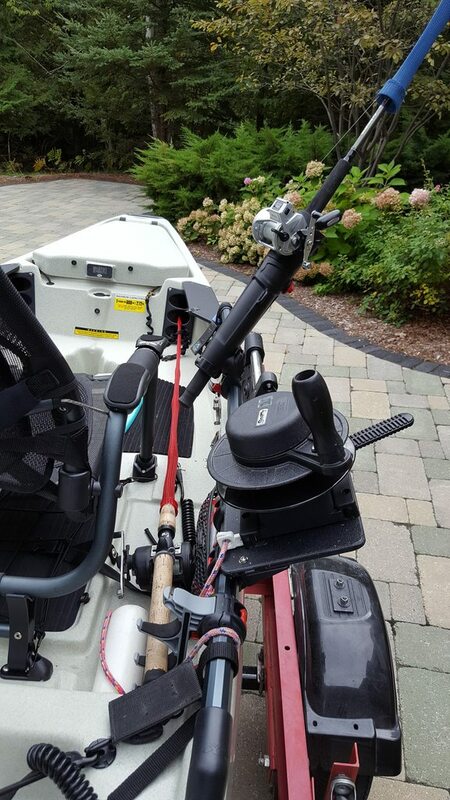 Remove the included Rod holder. Replace the SS cable with 100# braided line to reduce drag and vibration. I routinely fish this at 60-120 ft depths. Jim_MI...Very nice set up and the Scotty Depthmaster is an excellent unit. I know from my experience its a workhorse downrigger. Reducing the arm length is the best way to keep the weight close to the hull and improve tracking. 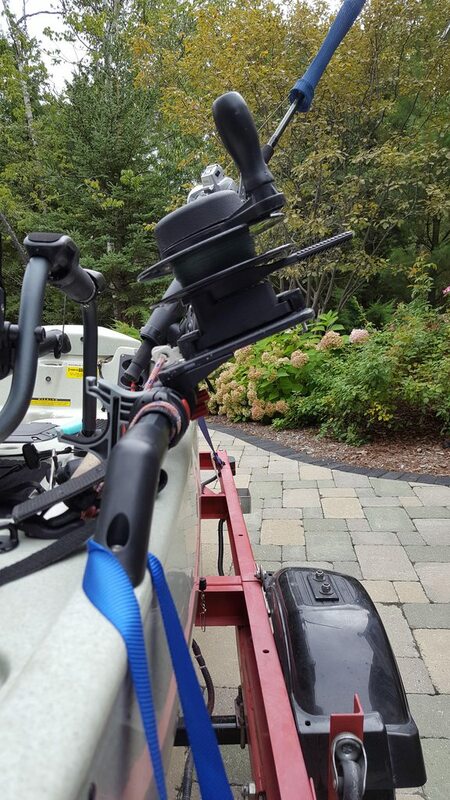 I used this exact model for a couple of years until I decided to try and adapt, my older 12 volt DC, Cannon Mini Mag, to my 2013 PA-14....all I can say is the electric down rigger is the ultimate solution if you can afford it. In my case, the Mini Mag was on my old 18' Jetcraft boat and I removed it, when I sold the boat in 2009, since I was not going to get the real value of it back in the sale......so, it sat in my garage until last year. Then, I thought that maybe, it would work on my PA-14. My only extra investment was an 18 Ah battery to drive it......the $50 investment was a really good choice in the end. If you exercise the down rigger frequently beyond 50', all I can say is the electric model is "really nice"....especially when you have a big fish hooked on! How much did you cut the arm down? I have 12" of metal pipe showing between the reel and the pulley hub. Be careful to eyeball how the line comes off the pulley when getting ready to cut, though. Cut off too much and the line won't wind back evenly onto the reel. Doc - As always, a marvel of ingenuity and engineering! For now, I get my leg workout on the Mirage Drive, and my arm workout on the downrigger. Thanks for all the help. 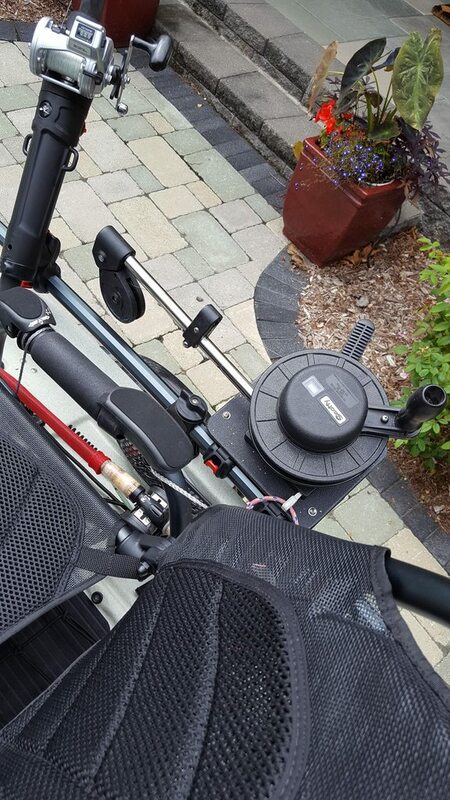 I was on the Scotty site and I started wondering if a scotty 1026 swivel mount would work. Can't see why it wouldn't. The swivel mount should work, but unless you also cut down the arm, having to reach 24", to grab the down rigger line is a real pain. Jim cut his to 12" and I cut my arm to 8" showing from the base.....the shorter arm makes a big difference in using the down rigger. Trial and error is not a bad thing to find what works best for your use. I as well have the Scotty Depthmaster 1050. All I did was get a universal h-rail mount, and a Scotty 1010 manual downrigger mount. Attach the 1010 to the universal h-rail mount. Only requires drilling a few holes into it. Put a little rubber tape on the h-rail, the clamped the universal mount over top of the tape at a slight up angle. Tighten the crap out of the universal mount on to the h-rail (I used pliers). I have found no need to shorten the arm, no issues with tracking, no issues with retrieving the ball. No issues with torque on the rail. I lower the ball gently by holding the clip so it doesn't jerk on the rail. 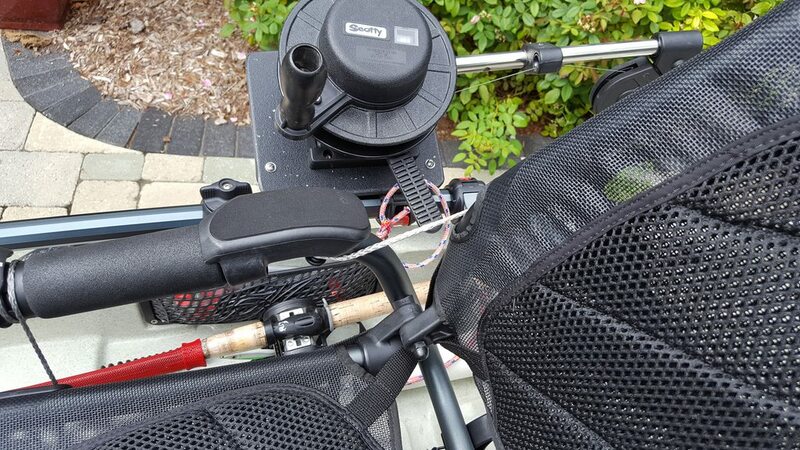 Now I mainly use 4lb balls, and replaced the cable with braid, and am fine to about 50 feet trolling lakes. I carry a 6lb and 8lb ball, I am just extra careful when using those. Sorry to dredge up this old thread but I have a Scotty Laketroller (1073) that I'm using on my Outback. The guy I bought it from put braid on it which I really like but I just noticed today that the pulley isn't always spinning when I reel up the ball so I took a look and the braid is cutting into the pulley. I see in one of the previous posts in this thread that WaterDog put a stainless steel pulley in to replace the plastic one and I was just wondering where you got it as that's what I'd like to do as well before it cuts through the plastic one and ruins my day! Scotty sells SS replacement cables and they should be easy to find at most places that sell Scotty gear. Another option is to just replace the pulley. If you call Scotty Customer Support they may be able to help you with that (I’ve found them to be very helpful). A third option is to simply repair your pulley. I’ve had good luck using epoxy and lightweight fiberglass. Thanks Dave. I'm not looking to replace the cable, just the pulley. I can easily get one at my local Ace but it isn't stainless so probably won't last long. I could fix the existing pulley but imagine that with the braid it will only be a temporary fix so would rather find a stainless steel replacement.